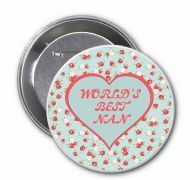 "WORLD'S BEST NAN" Novelty Badge Ideal Christmas or Mothers' Day Gift Idea. Delivered in a black organza bag. 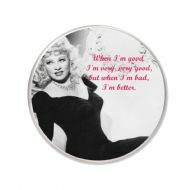 75 mm Round Fridge Magnet with Mae West image "When I'm good...." delivered in a black organza bag. 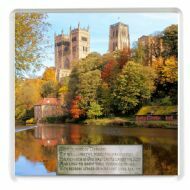 A Drinks Coaster with a Classic Autumn view of Durham Cathedral with Walter Scott's poem "Grey Towers of Durham"
A Round Fridge Magnet with Bob Marley image "Live the Life you Love, Love the Life you Live" delivered in a black organza bag. Any fool can be a Father but it takes a Real Man to be a Daddy Fathers' Day Fridge Magnet gift. 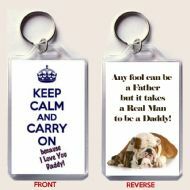 Any fool can be a Father but it takes a Real Man to be a Daddy Fathers' Day Keyring gift. 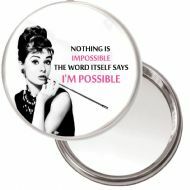 Audrey Hepburn "Nothing is Impossible, the word itself says I'M POSSIBLE" unique Compact Makeup Button Mirror. 75mm. Delivered in a Black Organza Bag. 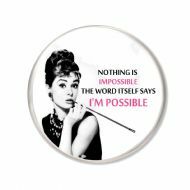 Audrey Hepburn "Nothing is Impossible, the word itself says I'M POSSIBLE" unique Fridge Magnet. 75mm. Delivered in a Black Organza Bag. Button Badge 75mm diameter with an image of Mae West with a funny quote "When Im good...." Delivered in a black organza bag to make a special gift. Compact, Makeup Button Mirror KEEP CALM AND GET YOUR LIPPY ON delivered in a black organza bag. 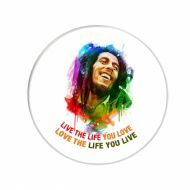 Compact, Makeup Button Mirror with Bob Marley image "Live the Life you Love, Love the Life you Live" delivered in a black organza bag. Compact, Makeup Button Mirror with Marilyn Monroe image "A smile is the best make up a woman can wear" delivered in a black organza bag. Compact, Makeup Button Mirror with Marilyn Monroe image "Give a girl the right shoes..." delivered in a black organza bag. Compact, Makeup Button Mirror with Marilyn Monroe image "We are all of us Stars and we deserve to Twinkle" delivered in a black organza bag. 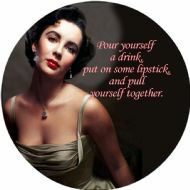 Elizabeth Taylor Pour yoursef a drink... unique Compact Makeup Button Mirror. Delivered in a Black Organza Bag. Elizabeth Taylor pour yourself a drink... unique Round Fridge Magnet. 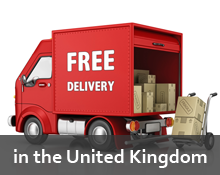 Delivered in a Black Organza Bag.